The H anoi Free Tour Guides Club (HFTG), 400 students without professional tourism training from different universities in Hanoi, offers free sightseeing tours of Hanoi to international tourists, with interesting discoveries about the capital. The 400 members of the HFTG can guide city tours in English, French, Japanese, Korean, Russian and Chinese. The club does not set a limit on members’ age, and all lovers of travel and Hanoi who also enjoy practicing foreign languages can join the club. To ensure the tours’ quality, candidates must sit a test administered by the club’s leaders. Although it may seem strange to many Vietnamese, the club has existed for nearly five years, and its website is viewed by many tourists and mentioned on numerous travel forums. The non-professional guides have made an impression on visitors with their enthusiasm and affability. 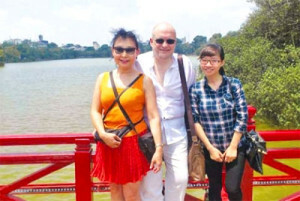 Hanoi attracts many tourists, but a large proportion of them are disappointed by their visit when they do not manage to discover the city’s hidden beauties, accessed through daily life activities around the corners, which the club’s members can help discover, said HFTG President Dao Thanh Cong. Guiding foreign tourists also helps improve the guides’ foreign language capacity, Cong add. That is why he decided to establish the club in January 2010. HFTG members are young and fond of tourism as well as learning foreign languages. They also understand Hanoi quite well. In 2010, when the club was recently established, its initial offers were met with suspicion from students regarding the club’s operational effectiveness and future. It took eight months for the club to gather 25 volunteers. The club also faced difficulties in seeking tourists. Though they launched a website and scattered promotional leaflets in hotels, foreign tourists were suspicious and wondered about the free offers. Many members asked for help from their friends in other countries to introduce the club. Finally, an Australian couple accepted the club’s offer, and the first tour was successful. The club’s managers watched the tour rise with both happiness and anxiety about the future ups and downs, which could discourage the members—especially new members. They were relieved when the club was contracted for 100 tours monthly. The club led a record of 2,000 tours in 2013. The record is expected to be broken soon, as the club has given 500 tours over the first two months of this year. Foreign tourists are attracted to the club’s tours because they can learn about Hanoi’s historical relics and landscapes in a way which differs from that of professional tour organisers. They can decide their tour’s duration, and the young tour guides tend to tell different legends and give different historical explanations. The relationship between the tour guides and tourists is not one between service providers and buyers; instead, they are friends. The guides can help the tourists understand Hanoians’ daily lives by experiencing traditional cafés, enjoying popular local dishes served by street vendors or drinking lemon tea at meet-up points beloved by young Hanoians. Wandering the ancient streets, tourists can discover small alleys and find interesting things behind the hustle and bustle and the rustic charm of the city. The tours have helped HFTB members improve their communication, knowledge, foreign language capacity and understanding about Hanoi. Minh Trang, an active member of the club, said that since joining the club, she has made friends with people from more than ten countries. Their stories have widened her knowledge, and her job requires her to read further materials to deepen her understanding about the culture of Hanoi and Vietnam. Many tourists call the guides ‘small ambassadors’ as they are really contributing to building the image of a friendly city for peace and promoting the capital’s beauty to international friends.